The Econo is our choice for the budget-minded. It is approximately 3/8” thick The Econo comes only in green vinyl for the top and green duravel for the base. No other colors are available in this closeout offer. Sturdy Pad Locks are optional. The Athena is our designer-grade table pad. It is approximately 9/16” thick. Choose from 30 colors including premium vinyls for the top and 8 colors in either duravel or suede-like cloth base. Sturdy Pad Locks and Cloth Locks are included. Don´t let moisture from a glass stain your table´s beautiful finish. Bottle openers and serving utensils can easily scratch your table. Serve right at the table without worrying about stains or food spills. Entertain without fear with Superior Table Pads on the table. Athena Style table pads (photo above) with Saddle vinyl top and Ebony suede base. Secret to entertaining? Keeping your cool. When it comes to holiday dinner parties, you´ll want to enjoy yourself along with your guests. Don´t let a spill spoil your evening. 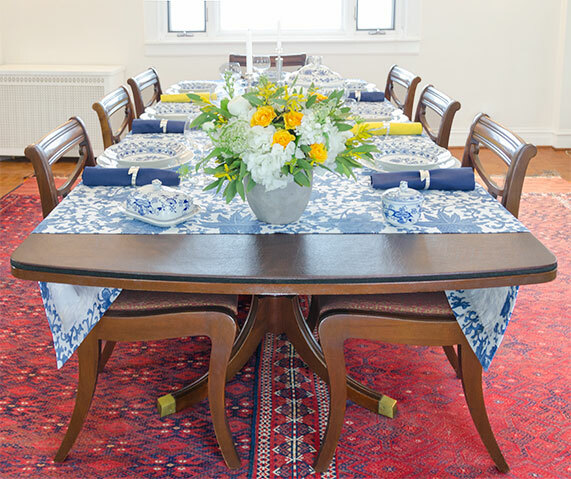 With table pads under the tablecloth, your gorgeous table will stay safe from spills, scratches and stains. Table pads are made as a set of two pieces for the main table with extra pieces for the leaves or extender boards. This table has rounded ends and the pads are custom made to fit the shape exactly. Athena style table pads (photo above) with Saddle vinyl top and Ebony suede-like cloth base. Table top pads are perfect for any busy household. Now you can use your table for informal dining as well as for games, crafts, homework or computers. 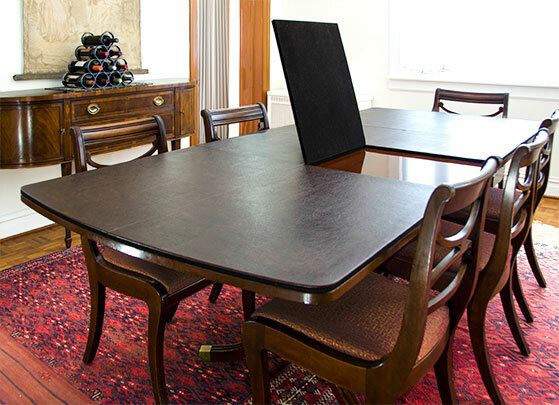 Get full use of your dining room or family room table with table pads protecting the surface. Match your table and décor from our wide selection of colors. Victoria Style table pads (photo above) Sandalwood vinyl top and Brown Duravel base. Buffet table pads are the answer for expanding your off-table serving space. 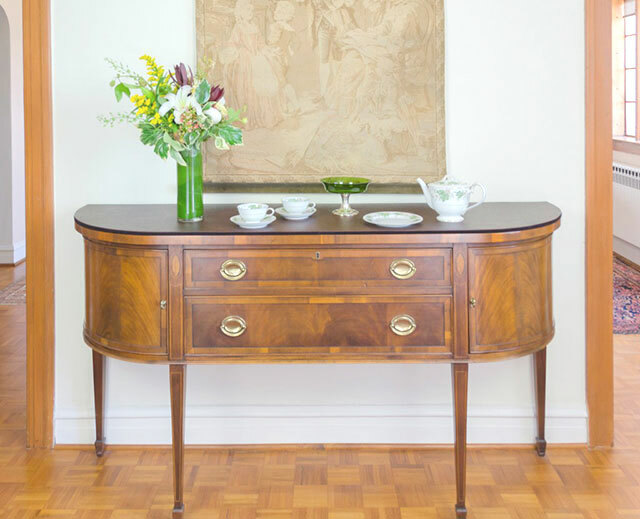 Remember, your beautiful sideboard or buffet server is not just for storing china and silverware, it´s also designed to be a working surface for entertaining. With buffet table pads on your sideboard, the wood surface is well protected from spills. Use your buffet for desserts and coffee after the meal so that guests can easily come back for more. Your sideboard has plenty of space for cake stands and sandwich platters, making it the perfect serving surface for special gatherings like showers, teas and graduation celebrations. Add a buffet to your order for extra savings! Athena Style table pads (photo above) Saddle vinyl top and Ebony suede-like cloth base. It´s no secret that dining room tables are prone to scratches, dents, heat damage and water damage, but table cloths can be a hassle and flimsy plastic coverings can look downright ugly! Superior Table Pads will efficiently protect your dining surfaces without sacrificing your dècor and they're available in any size or shape. Whether you're in need of protective table pads that are square, oval, rectangular, round or any other shape, we have the ideal solution for you. By filling in your table's exact dimensions, we can create custom table pads that will seamlessly fit even the most non-traditionally sized surfaces. We also offer a wide range of color choices on all of our dining room table pads to ensure there's something for every color scheme. Our wood grain table top pads are designed to create an "invisible look", meaning your guests won't even know table protection is in place! 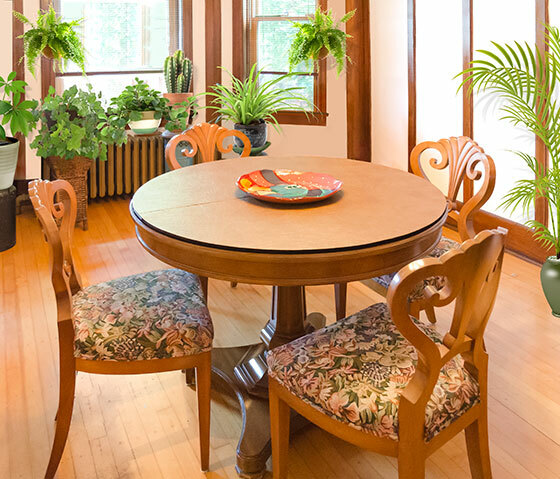 Our dining table pads have allowed our customers to protect their furniture for decades. Offering superior heat protection and waterproof vinyl tops, they're ideal for surfaces ranging from dining tables and buffets to sideboards and servers. Our round table pads are perfect for those looking to protect any size round dining table or end table. Accidents can and will happen, so ensure that your dining set is well protected with our high quality table top pads. Check out our wide selection of table protectors and dining table covers right here on our website. Remember, we hand craft all of our custom covers for dining tables to ensure quality in both materials and construction!